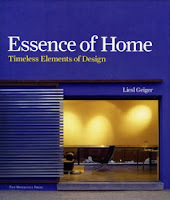 It’s been a pleasure reading and reviewing a new book by architect Liesl Geiger, Essence of Home: Timeless Elements of Design, published by The Monacelli Press. 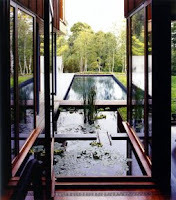 The book is primarily written for a sophisticated client wanting to build a person, high-quality, unique home working collaboratively with a skilled, creative architect. The book is of a high caliber in every respect: writing, content, photographs, illustrations, and production. The ideas are presented, illustrated, and enhanced by the use of excellent architectural photography.
. . . a willingness to include the client as a participant in the very subjective process of designing a home. The best clients are those who can realistically state their objective criteria and give shape to their subjective criteria, those who push the architect to explore alternatives and who step back at the critical point in the design process to allow the architect the final decision. This book will go a long way toward making better clients and toward making the collaborative exercise a successful adventure. While the book’s intended audience is thoughtful homeowners with the time, interest and resources to invest in creating an outstanding home for themselves, it is also useful for a residential architect in reflecting on the methods and approaches other architect’s employ to “bring their clients along” in understanding and participating in the design and construction process. The book is organized around the notion that the architect is the person who synthesizes the many varied motivations, input, and criteria that inform the design of a home. Perhaps the book’s greatest use would be by architects who suggest the book to their client as a thoughtful, useful primer. The reader will develop an appreciation for the vocabulary and an understanding of the various factors impacting residential design. While the book is generally oriented toward contemporary “clean design", it is not heavily slanted toward a modernist, minimalist aesthetic. Rather the overall atmosphere depicted feature natural materials, expressed structure, and open day-lit rooms without an excessive use of ornament, stylistic games, or other fetish based characteristics. Complementing the often stunning architectural photographs of completed interiors and exteriors are a select presentation of models, plans, elevations, and sections. The images and text are generally geared toward the non-professional reader who isn’t familiar with architectural terminology or design methodology. The Essence of Home compares favorably with Sarah Susanka’s series of books beginning with The Not So Big House. In many ways it provides more coherent, philosophically grounded arguments addressing function, design, materials, sustainability, and usability. These ideas are explained in a meaningful, direct yet informal manner. There’s a consistent clarity of aesthetic intent and convincing built results. Ms. Geiger intelligently uses the excellent examples of contemporary home design rather than using the book as a marketing tool to present her own work as the Not So Big books have tended to do. The tendency toward establishing a personality cult and the inherent eclecticism fundamental to Ms. Susanka’s design approach weakens her arguments and tends to suggest that stylist affectations are interchangeable qualities that can be applied to any “good design”. 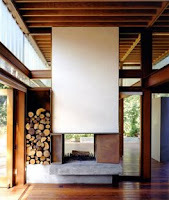 Geiger’s approach allows the multiplicity of factors impacting home design (site, climate, sustainability, materials, personalities, and spatial complexity) to work synergistically in favor of well-grounded, coherent homes allowing aesthetic intentions to encompass and coral the many factors pulling projects in opposing directions. 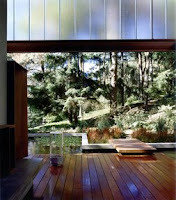 Some of the concepts addressed include the intimate scale of the human body, perception of far and near landscape contexts, addressing regionally appropriate design (akin to the concept of Critical Regionalism), the use of local materials and crafts craftsmanship, the importance of natural light and of shading devices, and the appropriate use of artificial light. The homes depicted tend to be high-end, expensive homes where concessions to tight budgets are not a significant constraint although a range of costs and finishes are presented. The functional division of a home into public and private realms is explained. The interiors generally feature contemporary furniture and art work with an informal, flexible aesthetic approach. The ideas of sustainability and value of recycling buildings are introduced. The book is organized around seven fundamental elements of design. Each element has a chapter devoted to it. These elements are: design origins, site and scale, language and style, openings and light, spheres of living, flow of space, and sustainability. More than 50 homes are illustrated, while ten are shown in detail and discussed at greater length. The locales range across North America, including the East Coast, West Coast, Southwest, Northwest, Mexico, and Canada. The works illustrated are by twenty leading residential architects, including Steven Ehrlich, Lake | Flato, Richard Gluckman, Stephen Harris, Shim-Sutcliffe, Cutler Anderson, and Charles Rose. These architects should be familiar to anyone devoted to residential design and construction that follows major industry publications. I recommend this book to designers, builders, and homeowners passionate about residential design of the highest caliber. All images are from the Essence of Home: Timeless Essence of Design, fully copyrighted, and may not be reproduced.